Summer has brought much activity and change here at Kata Golda. In mid-May the new 2012–2013 collection made its public debut in NYC at the National Stationery Show, complete with a new print catalog and website. It was great to put faces to names and reunite with friends and clients, many of which I've not seen in awhile. As always, NYC treated Kata Golda very kindly. And so in an effort to keep in better touch with all of you, my blog (Little Notes from Kata Golda) is evolving into this new format — a newsletter aimed to inform you about new products, seasonal specials, and give-aways. Just like the old blog, the newsletter will also include a glimpse behind the scenes of Kata Golda, as well as DIY projectsdesigned to inspire some creative work of your own. Whether you are a new fan, longtime customer, wholesale client, publicist, or blog writer, I hope you find this newsletter helpful and enjoyable. It will only be sent out occasionally (about once a month or so), supplemented by posts on Facebook andTwitter. Constructive feedback is always welcome, and you can update or change your subscription at anytime using the links at the bottom of the newsletter. It takes copious amounts of time and patience to come to a place where you see the fruits of your labor. 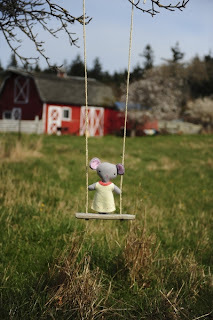 Farming and gardening are my role models for how I want to live a creative life and nurture the growth of Kata Golda. Creating this new catalog felt a lot like cultivating a garden: deciding on which favorites to include in a limited space, pruning out things that just aren’t fruitful anymore, trying to guess what the seasons will bring in a new landscape. Just like the farmers I volunteer with every week (in exchange for a big basket of produce — yum! ), I rely on long lists to keep me on track, prioritizing tasks based on the weather forecast (literally, as I love nothing more than to sit in the sun and stitch). 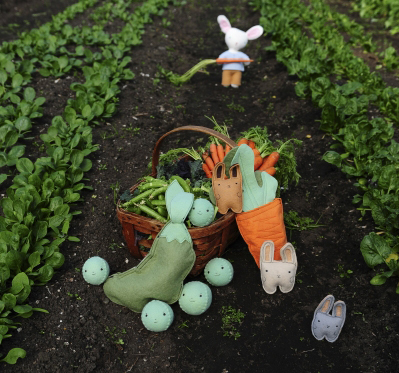 So when it came time to create the photo for the new catalog's front cover, it seemed perfectly fitting to show the garden pals and bunny stuffed companion working in the farm's greenhouse, surrounded by crops. 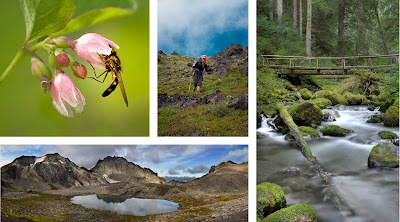 Equally inspiring to my work is the untamed landscape of the Olympic Mountains where I choose to play this time of year. I spent a few days backpacking there last week, feeling very contained (having all I need to keep me warm and fed in my pack) and tremendously small. It is vast and it is humbling, and a great reminder for me to honor, respect and defend the awe-inspiring magic it holds. I hope a little bit of this magic comes through in the latest Kata Golda collection. 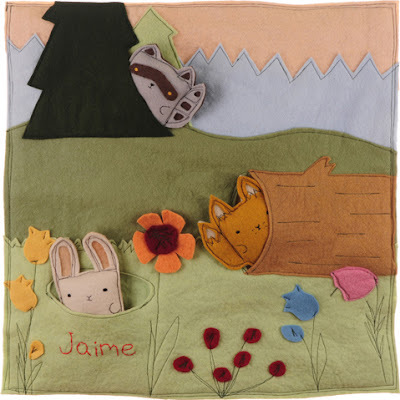 In it you’ll find a trove of new items: a new series of DIY kits, pillows, letterpress printedcards and gift tags, interactive wall hangings (shown below), shoulder bags, and more. You’ll also find old favorites such as personalized felt patch photo albums, stuffed companions and ceramic tea cups. But I’m most excited by the products that were inspired by my love of nature and gardening — and what better time of year to explore the outdoors than summer time? How does summer inspire you creatively? Email your brilliant answer (or photo) and we’ll choose our two favorite responses. 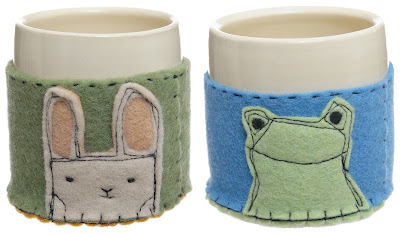 Each winner will get a hand-thrownceramic mug with wool felt appliqué cozy, featuring one of our two favorite summer critters: a frog and a rabbit. Email your inspiration, with "Summer Inspiration GIve-Away" in the subject line, to information@katagolda.com by Monday September 3, 2012. The two winners will be notified by email in September, and their answers will be shared online.